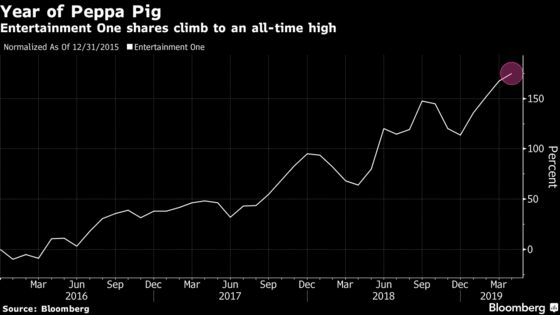 (Bloomberg) -- This is a great year to be a company that makes a wildly popular cartoon series about a family of pigs that’s big in China. Production firm Entertainment One Ltd. saw revenue in China jump 50 percent, the Toronto, Canada-based company said in a trading update. The timely release of “Peppa Pig Celebrates Chinese New Year” in January teed up a porcine-heavy year, with 117 new episodes in the pipeline as well as the opening of four new indoor attractions in the U.S. and China. Shares in eOne jumped as much as 6.2 percent to a record after Thursday’s update. They have surged more than 30 percent this year as Peppa recovered from a previous misadventure as an anti-establishment symbol in China. “There is no sign of the market wearying with Peppa Pig and the number of live licensing and merchandising contracts continues to increase,” Edison Investment Research analyst Fiona Orford-Williams wrote in a note.